I took a lot of pictures of this white BMW E90 335i sedan when I wrapped it. 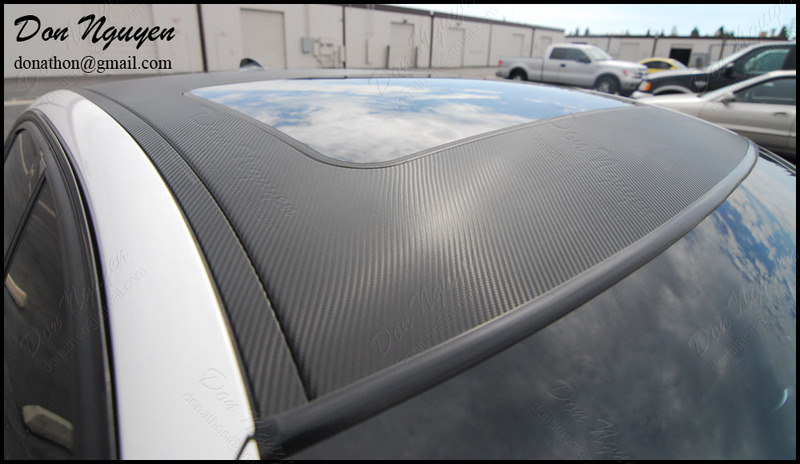 The owner of this car wanted me to wrap his roof in the 3M 1080 gloss carbon fiber vinyl material. I also did the top portion of his bumper where it meets with the splitter, to try and give it a continuous look. It was a bit overcast the day I did this car, so it's actually a bit hard to tell that the film was actually the gloss carbon finish and not the dinoc matte carbon fiber finish. The rear trunk spoiler is also real cf in addition to the front splitter, so you guys can sort of get an idea of how real cf and the carbon fiber material I am using compares up next to each other. The owner of tho car drove out to me in Anaheim Hills/Orange County to have the vinyl work done.